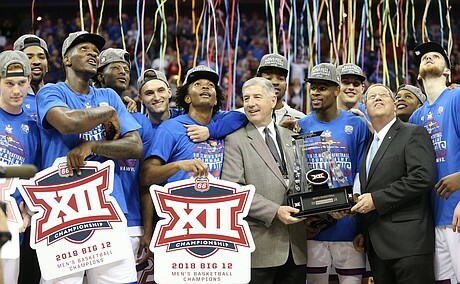 When asked about the Big 12 conference championship last December, KU Head Coach Bill Self said, “13-5 will get it free and clear.” The Jayhawks did in fact win their 14th straight title with a 13-5 record, but more importantly, Self’s statement accurately described the unmatched combination of depth and talent in the Big 12. No two season are ever quite the same, but 2017-18 was a definite outlier among the 10-team Big 12's previous seasons. This season, Big 12 teams finished with a cumulative record of 204-121, or a 62.7% winning percentage. For comparison, the next best conference in Division I was the Big East, a similarly deep 10-team conference bolstered by its top two teams (Villanova and Xavier) going an unprecedented 65-10, at 62.4%. The 2014-15 Big 12 provides the closest possible match. That group went 205-121, good for the best winning percentage in recent memory at 62.8%, thanks to an unprecedented five teams with 10 or fewer losses. 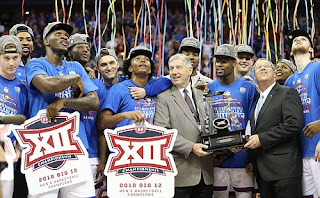 That season is also the only other from the past seven in which the conference champion, Kansas, lost five games (though I don’t recall any predictions from Self). However, concerning complete depth and talent, the 2017-18 Big 12 still stands alone. For example, in 2014-15, last-place Texas Tech went 3-15 in the conference and finished 10 games behind conference-champion Kansas. Two teams also finished with fewer than eight conference wins, and sub-.500 overall records. This season the difference was only nine games between Kansas and last-place Iowa State (4-14), and the Cyclones were the only team to finish with fewer than eight conference wins and a sub-.500 record. Perhaps the only other factor in 2014-15’s favor is that an impressive four teams finished within two games of the conference champion, as opposed to just two teams last year. This postseason was also uniquely special for the Big 12. An impressive seven teams went to the Big Dance in both 2015 and 2018, but two additional teams also made the NIT in the 2018. More importantly, several teams thrived in the 2018 postseason, including three in the Elite 8 and one in the Final Four. No other Big 12 group from the past seven seasons came close to that type of success. Article originally published in the Cunningham Courier.